I was hesitant on buying a new tree to replace a dogwood tree I had for almost two years. That tree did well and then for some reason got diseased and died. 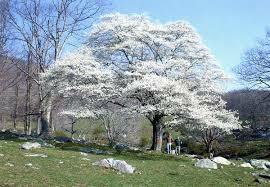 I think it had a disease that I read up on, that other dogwoods that were similar to mine, where getting. My spouse purchased this tree for me for my birthday two years ago. This year it finally grew a foot and looks good. Very happy with this tree. Can't wait until it fills out and gets white flowers and red berries. Serviceberry Tree otherwise known as the Downy Service Berry, Sarvis Tree, and Juneberry, the Service-Berry Tree is a lovely specimen with the four-season appeal. You can expect good results with this plant in moist, well-drained soil that is free of clay. This tree also prefers slightly acidic soil and grows at a medium pace, generally around 13-24 inches per year. Though considered a small tree, the Service Berry is a lovely addition to lawns and parks. Supposed to be not only a four season tree but one of the best choices for four season splendor, the Service-Berry Tree sports clusters of delicate white flowers in the late spring that give way to edible fruit during the summer months. Serviceberry Tree - Amelanchier. Serviceberry Tree sports clusters of delicate white flowers in the late spring that give way to edible fruit during the summer months. In the fall, the leaves of Service-Berry Tree turn vibrant red and gold making it a delightful addition to autumn foliage. In the fall, the leaves of Serviceberry Trees turn vibrant red and gold making it a delightful addition for autumn foliage. The fruit grown on this plant will attract a wide variety of songbirds and even some small mammals to your yard, making it an excellent choice for wildlife enthusiasts. Service Berry trees can be grown singly or in bunches to beautify your property. The leaves are simple, about 3 inches long, and closely resemble those of apple trees. The tree can have a single or multiple trunks depending on pruning and preference. The bark is attractive in winter and the fruit grown is edible to humans and wildlife. This tree is versatile and reasonably hardy making it an excellent addition to your landscape. Though it requires some pruning, this is minimal, and overall the tree is easy to care for. Service Berry Trees are shipped in a bare root state that ensures best quality and ease of planting.